Da Sanga Azadi Da — “What freedom is this?” — is the Pashtun Tahaffuz Movement (PTM) anthem heard at their gatherings and jalsas. PTM’s figurehead, Manzoor Pashteen, asked that question in Karachi — the world’s largest Pashtun city by population — on Sunday, May 13, as the PTM headed over to Pakistan’s main metropolis. But if we are to trace the origins of some of the grievances of the Pashtuns of Pakistan’s tribal areas, we will have to go all the way back to 1893 — to the year when the Durand Line was set in stone as a border separating British India from Afghanistan. Characterised by the Raj as ill-defined and turbulent, these regions compromised the defence of the borders of British India. They did not border a recognised foreign power; rather, they separated the Raj’s dominion from the ‘wild’, ‘lawless, ‘unsettled’ and ‘warlike’ tribes living in the hills that stretched into Afghan lands. The basic aim of the Raj was to ensure that order prevailed along British India’s periphery and that a ‘safe and permanent frontier’ was established along its borders. “Now that we had established our authority and supremacy over the district in which warlike operations [the Afridis revolted after the Durand line was proclaimed — a revolt which the British successfully quashed] had been taking place, it seemed an opportune moment to define what were the objects which we should wish to promote, what should be our frontier policy in India. “[Lord George Hamilton] had always held that the presence and the advance of Russia in Central Asia was a factor connected with our frontier policy which we could not ignore. The FCR recognised and codified the existence of the jirga, or Council of Elders. But while the jirga‘s punishments and decisions were based on tribal customs, the FCR allowed and empowered the British Deputy-Commissioner to make both civil, and criminal, references to Councils of Elders. In other words, supreme power lay in the hands of the Deputy-Commissioner: he could question the jirga‘s decisions, veto or pass criminal sentences and bar hostile tribes from entering British India. 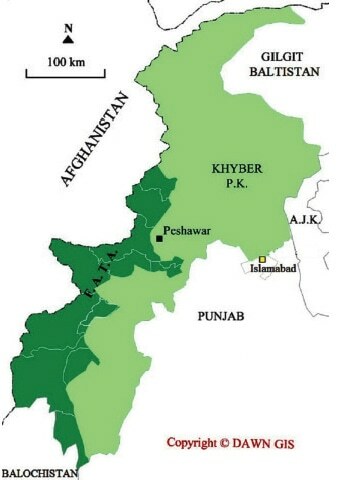 And because of the Raj’s stifling military presence in the tribal borderlands — with four ‘movable columns’ in Peshawar, Kohat, Bannu and Dera Ismail Khan, along with multiple corps of military police, levies and militia across the region, from Waziristan right up to Chitral — these tribes, more often than not, had no option but to accept the terms laid upon them. In 1937, the Evening Telegraph and Post in Dundee, Scotland reported about “Tribal Hostages Handed Over”. It detailed that over a hundred men were “handed over as hostages” to the Government of India by the jirga of the Tori Khel tribe in Mirali, Khaisora Valley, Waziristan.